The US' decision to exit the Global Compact on Migration will have repercussions for US policies, Vassilis Fouskas, professor of International Relations at the University of East London, the Editor of the Journal of Balkan and Near Eastern Studies and the Director of the Centre for the Study of States, Markets and People told Radio Sputnik. Sputnik: How important was Washington's role in the agreement? Vassilis Fouskas: I think it was very important, I mean we should remember that that agreement [Global Compact on Migration] was struck under [former US President Barack] Obama and it was Obama actually that convened that agreement. And it was a milestone in my view for global solidarity on refugee protection. Obama convened the summit and he was supported by countries which had disproportionally contributed to migration, such as Jordan and Germany, for example. So he had a wider consensus and now we see these all going down to drain, you know, this effort. Sputnik: What about timing, why do you think it's happening now? Vassilis Fouskas: I believe that the Trump administration is in process of revising major tenets of the US international policy. I mean this "America first" idea that comes from Trump is basically saying that things are decided in America, not multilaterally, and it is saying the thing that there would be bilateral relations determining US policy. I think that it is what we are heading towards and we are kind of reliving the era of the interwar period in a more extended timing if you see what I mean. Restrictions on migration are connected to internal domestic problems the American society has like in an interwar period they had — they tried to block migration in 1921, for example, and so on. Sputnik: Of course, we've seen other countries' reluctance to conform to the refugee quotas. Do you think other countries will now follow suit? Vassilis Fouskas: Yes, it is, it is very likely, and as I've said we are heading towards a repetition of the interwar period. I mean, if you remember the number under Obama was 100,000; now it's being reduced and before that, under [former US President Bill] Clinton the United States allowed an influx of up to 670,000 in the 1990s. And this has changed drastically. Sputnik: Looking forward, what countries do you see possibly following Washington's example? Vassilis Fouskas: We need to see in that respect, which countries were very close to Obama, I mean obviously certain European countries, like Germany for example. Germany still needs — [it] has an important industrial structure — [it] needs migrants and low wages. So Germany could potentially oppose this US policy but at the same time, you know, when you have to go back to your bilateral agreements it depends on a number of other factors. I cannot really say with precision which countries will follow — this is a matter of contemplation but certainly this American move will have an impact on the other countries. Sputnik: The US, of course, recently reduced its refugee intake by 45,000. How likely is it that they will lower this figure even more? Vassilis Fouskas: It is likely to go further down but one thing we should remember is that no country is able to stop this type of population movements on the ground, as we say. I mean when, for example, in the late 19th century the United States tried to stop Chinese migration coming to the US, the Chinese migrants flocked into the United States from the Canadian border, you see what I mean. So, this is actually very unlikely, whatever the official quota, these in practice are exceeded, you know, the number is always higher. The same is happening in Britain actually. Sputnik: But if the US decision to withdraw from this agreement is going to have a snowball effect and other countries follow suit, won't this have truly catastrophic consequences and proportions? 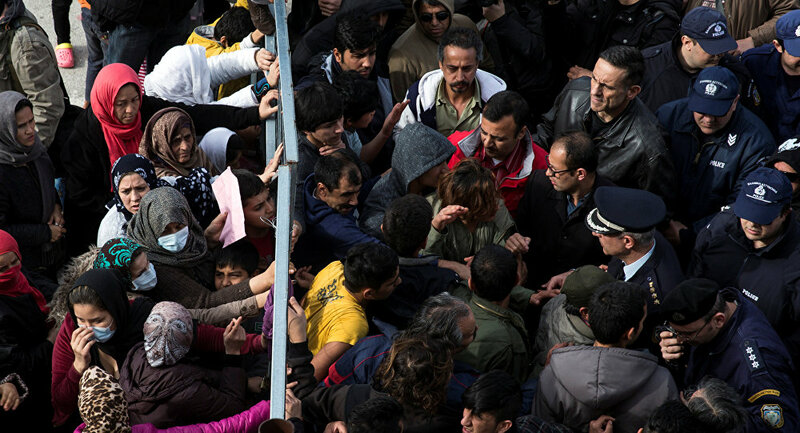 Vassilis Fouskas: Yes, I fully agree, on the migrants and refugees, absolutely. I mean it would be catastrophic. This is actually the blowback, what is happening in the United States and in Europe at the moment because, you know, they project power across the globe, they go to Afghanistan, they go to other parts of Central Asia, the Middle East and Iraq and so on and Syria, Northern Africa and this blowback devastates the populations then the populations come to more prosperous countries seeking security and jobs and education. The Western economies are in a recession, are in decline, this is the other big issues they cannot absorb extra labor population that is coming into them. So it is really complicated. If you want to analyze immigration, it is a really complicated issue. Sputnik: If this blowback is going to happen, and it's all going to be pretty catastrophic, what possible action could be taken then to somehow mitigate the consequences? Vassilis Fouskas: I place great hopes on that declaration of September 2016 under Obama, but now I will remind you that this was not legally binding and we are seeing now the United States withdrawing from a kind of treaty that is not legally binding and yet there would be some political repercussions on the US policy, US policies changing on migration and refugees. What is the future, I mean, if the United Nations cannot act unanimously on this major kind of the UN, the leading Western power, the US, withdrawing from a non-legally binding commitment, then I think the future is actually very bleak.